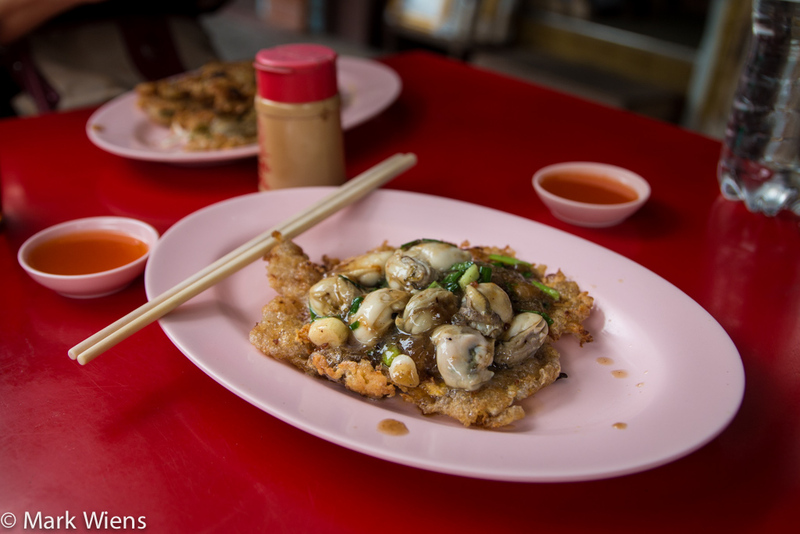 Hoy tod (หอยทอด also sometimes spelled hoi tod) is a Thai style oyster or shellfish omelet. However, it’s often more like a crispy pancake rather than an omelet in my opinion. 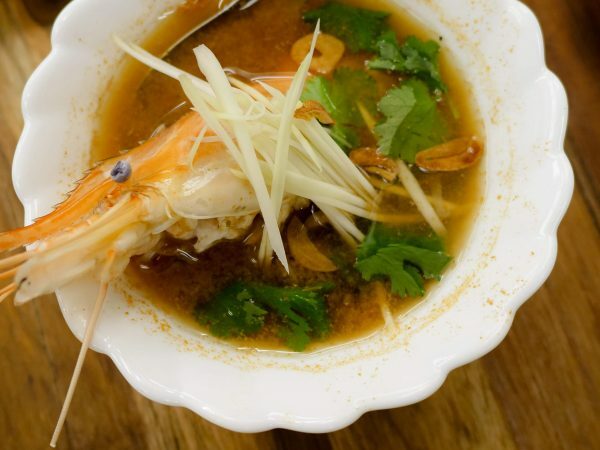 The dish is sort of the relative of Pad Thai, and occasionally at restaurants around Thailand you’ll find both dishes served at the same restaurant. 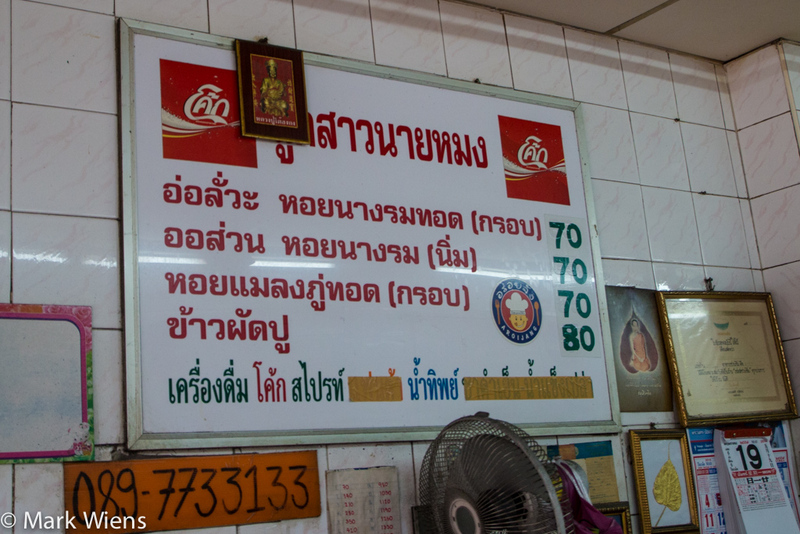 However, there are also many restaurants that only specialize in Hoy Tod or Pad Thai. Read more about the Pad Thai / Hoy Tod face-off here. 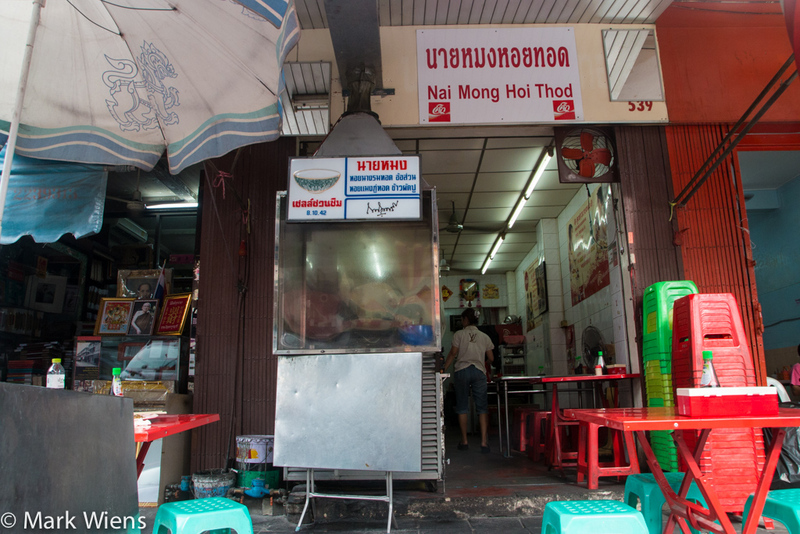 But anyway, one of the most famous restaurants to eat hoy tod (หอยทอด) in Bangkok is a restaurant known as Nai Mong Hoy Tod (นายหมงหอยทอด, they spell their name Nai Mong Hoi Thod). 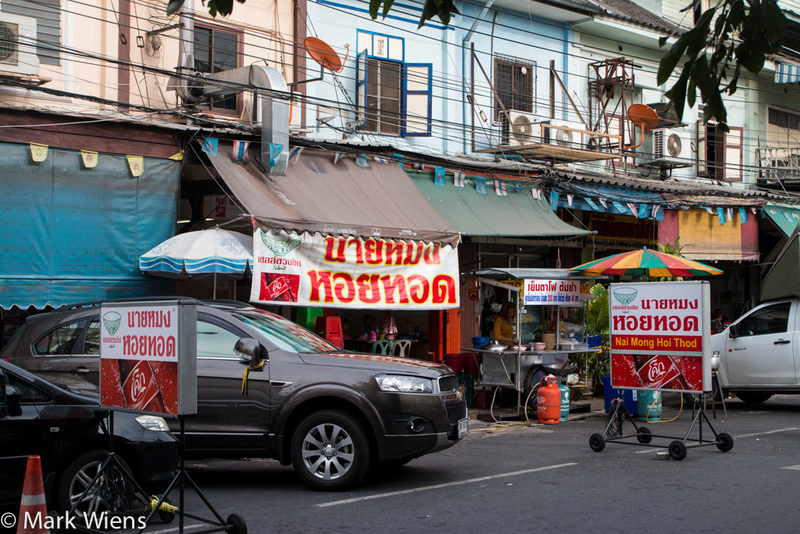 You’ll find them in Yaowarat Chinatown, just off Charoen Krung Road, about 20 meters down Phlap Phla Chai street. 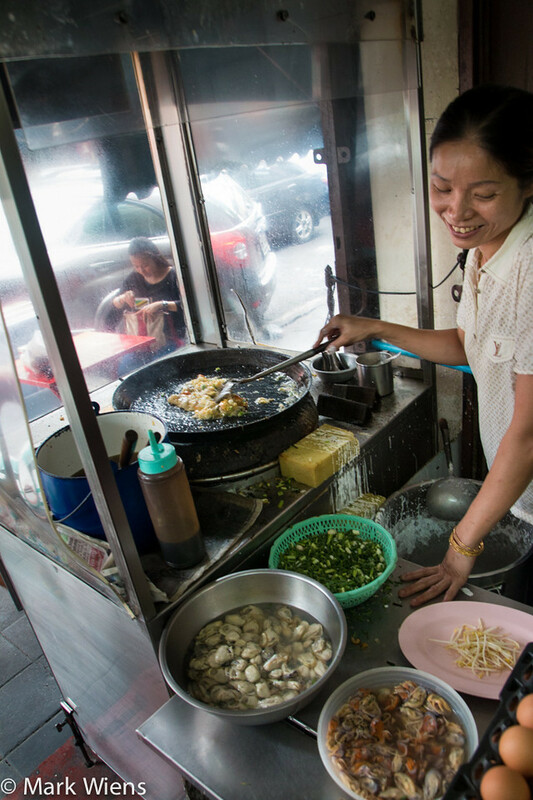 It’s just a short distance from the serious street food egg noodle spot, and if you keep walking down Phlap Phla Chai for about 15 minutes you’ll hit the kua gai intersection. Nai Mong Hoy Tod (นายหมงหอยทอด) is a shophouse style restaurant, and you can choose to either sit inside, or open air on the sidewalk. I normally prefer to grab a seat outside to take advantage of the street-side atmosphere. 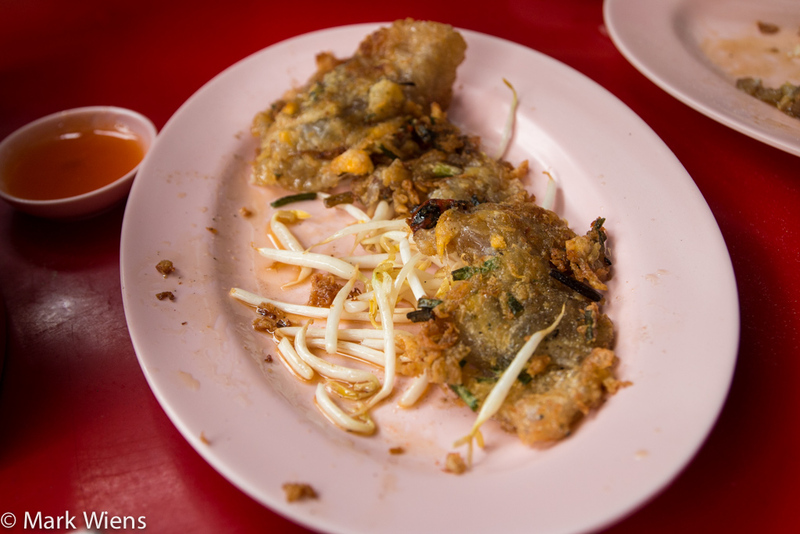 You can either choose to order the awlua (อ่อลั่วะ) version, which is crispy (this would be the normal version of hoy tod), or what they call awsuan (ออส่วน), which is the goopy version, and should be similar to this. You then have a choice of either mussels or oysters. And since I didn’t want to choose, we got one of each, both crispy. If you go to eat hoy tod (หอยทอด), just know from the beginning that you’re about to eat some serious oil and grease. It’s not exactly what you would call a healthy Thai dish, but it is a tasty one. At Nai Mong Hoy Tod (นายหมงหอยทอด), they have a pretty cool cooking setup, and their cooking station sort of reminded me something like police shields. The heavy iron skillet sits on top of a custom made charcoal burning stove, and they’ve added a fan to the fire with switch, so when they really need to bump up the heat to get the food sizzling they just turn on the fan, as sparks fly. Oil, and I believe lard to be more specific, is used generously to make hoy tod (หอยทอด). The oil is heated first, then a pancake like batter goes in until it start turning golden brown. More oil is continuously added throughout the cooking process to ensure the omelet is as crispy as possible. First they brought us the hoy malang poo tod (หอยแมลงภู่ทอด (กรอบ), the crispy mussels omelet. 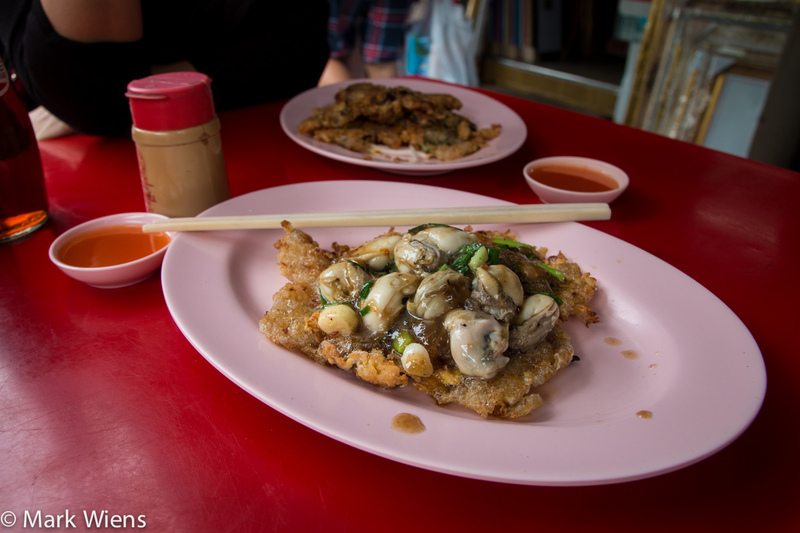 For this dish, they embedded the small mussels in the batter, cracked an egg in the middle, whirled everything up, and cooked it until it was golden in color, and extremely crispy. It was placed on a bed of bean sprouts to soak up a bit of the extra grease, and served with a tomato sauce prik dipping sauce. Like I mentioned, it was more of a pancake rather than an omelet. They use sticky rice flour to the make the batter, so the texture is really sticky, and has some elasticity to it (not in a rubbery kind of way, but more in a cheese kind of way). 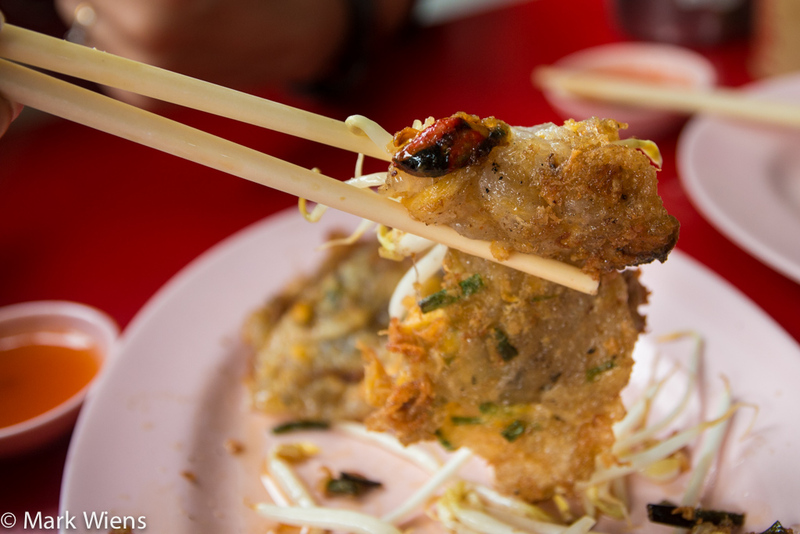 The hoy malang poo tod (หอยแมลงภู่ทอด (กรอบ) was wildly crispy on the edges and in the middle, and then sticky on the inside. The mussels were quite small, and there weren’t a lot of them in there. 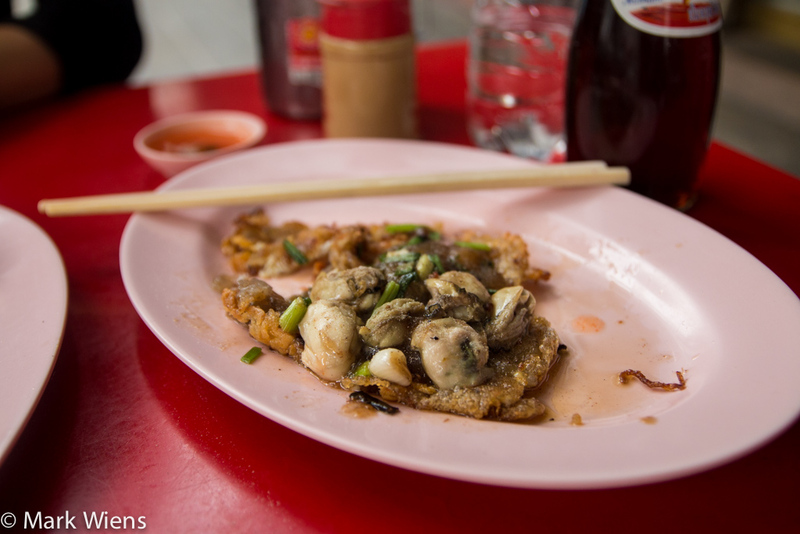 The The hoy malang poo tod (หอยแมลงภู่ทอด (กรอบ) was quite tasty, but I thought the ratio of batter of mussels was a little low. A quick dip in the sweet tomato sauce, added an extra tanginess to the crispy pancake. 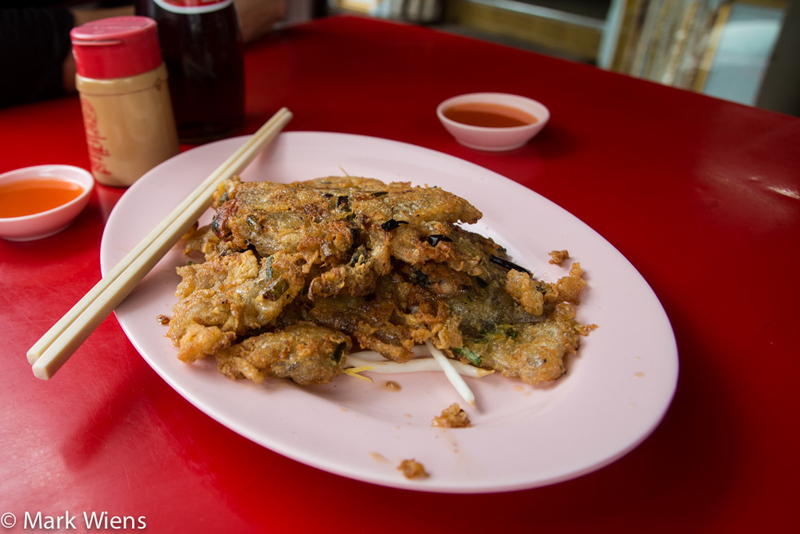 A few moments later, fresh out of the hot oil, came the hoy nang rom tod (อ่อลั่วะ หอยนางรมทอด (กรอบ), the crispy oyster omelet. 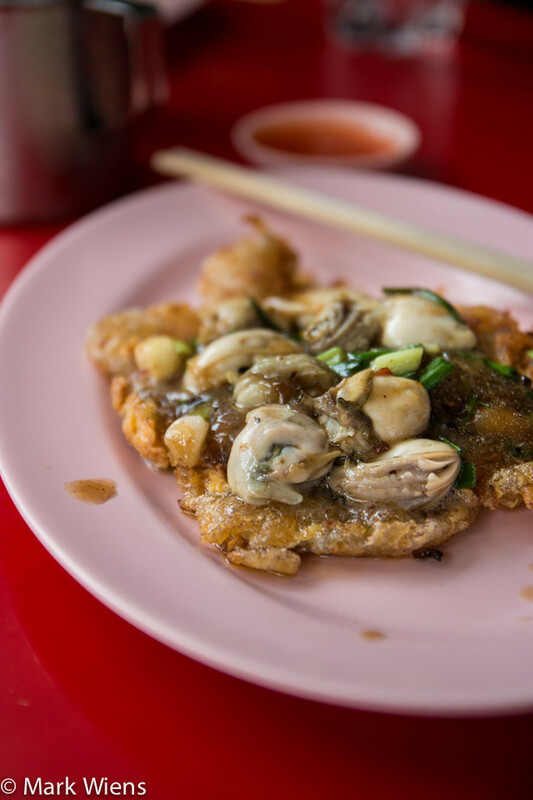 Whereas the mussels were embedded into the mussels omelet, for this version the oysters were placed on top of a little disc or patty of crispy fried batter. First of all, oyster are just one of the great edible things in this world. Pair a handful of oysters with something incredibly crispy and rich, and you’ve got a combination that is sure to satisfy. As opposed to the hoy malang poo tod (หอยแมลงภู่ทอด (กรอบ) which had too much batter for me, I thought the ratio of shellfish to pancake was better with the hoy nang rom tod (อ่อลั่วะ หอยนางรมทอด (กรอบ). The hoy nang rom tod (อ่อลั่วะ หอยนางรมทอด (กรอบ) was very good, but extremely greasy. Nai Mong Hoy Tod (นายหมงหอยทอด) serves a very tasty version of hoy tod (หอยทอด), and if you like this dish, this is a definite place you must check out. 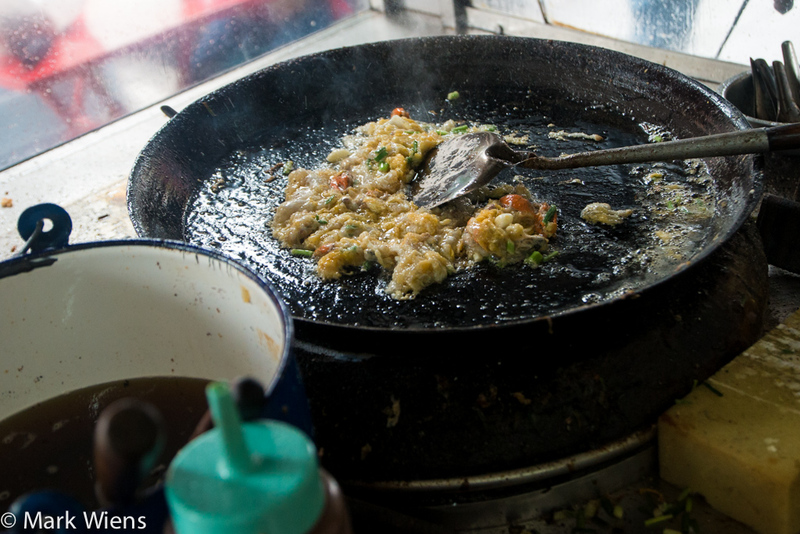 If you’re not so much into oily and greasy food, you should stay far away. เปิดบริการทุกวัน 10.30 – 21.00 น.
Nai Mong Hoy Tod (นายหมงหอยทอด) is located just a 5 minute walk from Yaowarat Road, on the more local side, just off Chaoen Krung road. Go down Phlap Phla Chai about 20 meters, and the restaurant is on your right hand side. Thanks for this article, I’ve been 3 times to this wonderful place now and always make it a must visit on each trip. Hey Matt, that’s awesome, glad you like the hoy tod here! This is my first trip to Bangkok and I have found your blog really useful. Just to let you know I went by here this afternoon and it was shut. Perhaps it is closed Sunday? You might want to amend the opening hours just in case. I did go crazy with the street food at a nearby alleyway market though. Have you ever considered doing food tours? Hi Lee-Ann, thank you for letting me know. It’s a bit of a tough time to know about opening hours these days as many take off for the new year, but I’ll try to check out the opening times. Glad you found some delicious replacements. I have done some tours in the past, but due to my unpredictable travel schedule, I haven’t been able to in a while, but maybe in the future again. Are you living in Thailand, or just visiting? Hi nark and dwight, we saw your reccomodations and headed to this stall this evening but turns out that they were shut. We were so dissappointed ;( in any case, i would still like to thank you for writing this article, i found a yummy century egg congee stall nearby the awlua stall. Hahaha! Hi Nancyb, so sorry to hear they were closed, but glad you found some good century egg congee!